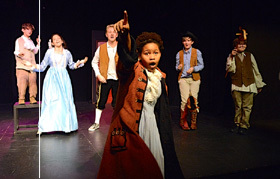 Kids ages 8-16 will have a chance to write, direct, improvise, and act with their peers in their own play. Our weeklong program culminates in an original production for our family and friends! All classes are held at the Broadwater, home of the award-winning Sacred Fools Theater Company, and taught by working actors who have performed on Broadway and in Regional theaters around the country. 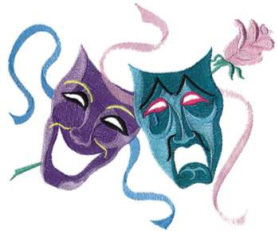 Week 1, Mon-Fri, July 16-20: Senior Fools workshops in improvisation, writing an original play, and directing. Week 2, Mon-Fri, July 23-27 & Sun, July 29: Junior Fools join in the workshops, and both groups stage an original play! Libby Baker fell in love with theatre when she began performing in productions as a child. She studied acting, directing, and set design at Moorhead State University in Moorhead, Minnesota. She Co-Directed the DlinSpin Summer Drama Camp for Kids in Denver, Colorado, and co-authored their original productions. Libby's career spans regional theatres across the country, as well as commercials, TV and film. She can most recently be seen in Up All Night, Modern Family, and Jon Benjamin Has A Van. Libby also teaches science and gardening classes to kids of all ages, all over Los Angeles. Emily Kosloski began performing in grade school in community theater productions and in classes just like this one! She has a degree in Voice and Musical Theatre from Northwestern University, and has been seen on Broadway in Les Miserables and in large and small regional theaters all over the country. She is also an accomplished commercial and television actress, having guest starred in many shows including Drake and Josh, ER, Southland and Cold Case. She has been teaching kids of all ages for 12 years in the Los Angeles area! Ruth Silveira taught theater games to the middle school group at KYCC (Koreatown Youth and Community Center) for several years as part of the outreach program of Laughter 4 a Change. She is a member of Sacred Fools Theater Company, where she has acted, directed, written, and costumed.